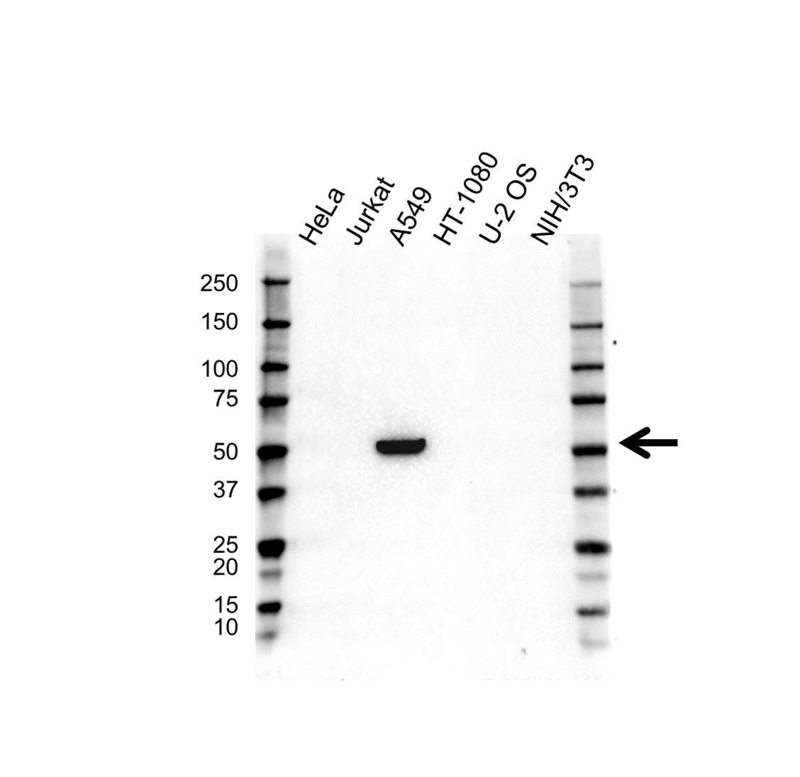 Western blot analysis of whole cell lysates probed with PPP2R2C antibody followed by detection with HRP conjugated Goat anti Rabbit IgG antibody (1/10,000, STAR208P) and visualized on the ChemiDoc™ MP with 27 second exposure. Arrow points to PPP2R2C (molecular weight 52 kDa). Rabbit anti-human PPP2R2C antibody recognizes serine/threonine-protein phosphatase 2A 55 kDa regulatory subunit B gamma isoform, also known as PP2A, subunit B, protein phosphatase 2 or protein phosphatase 2A1 B gamma subunit. Rabbit anti Human PPP2R2C antibody recognizes PPP2R2C, also known as PP2A subunit B isoform B55-gamma, PP2A subunit B isoform PR55-gamma, PP2A subunit B isoform R2-gamma, PP2A subunit B isoform gamma or IMYPNO1. The product of the PPP2R2C gene belongs to the phosphatase 2 regulatory subunit B family. Protein phosphatase 2 is one of the four major Ser/Thr phosphatases, and it is implicated in the negative control of cell growth and division. It consists of a common heteromeric core enzyme, which is composed of a catalytic subunit and a constant regulatory subunit, that associates with a variety of regulatory subunits. The B regulatory subunit might modulate substrate selectivity and catalytic activity. PPP2R2C gene encodes a gamma isoform of the regulatory subunit B55 subfamily. Alternatively spliced transcript variants encoding different isoforms have been identified (provided by RefSeq, Jul 2008). Rabbit anti Human PPP2R2C antibody detects a band of 52 kDa. The antibody has been extensively validated for western blotting using whole cell lysates. Anti PPP2R2C detects a band of approximately 52 kDa in A549 cell lysates.